About a year and a half ago, we covered a cooperative board game called Castle Ravenloft. That game was the first in a series using rules known as the Dungeons & Dragons Adventure System. This system, loosely based on the latest version of the D&D RPG rules, allows all players to play together as a team, with no Dungeon Master required. Castle Ravenloft was quite good, as was the follow-up, Wrath of Ashardalon, in which the heroes invade a giant red dragon's volcanic lair. 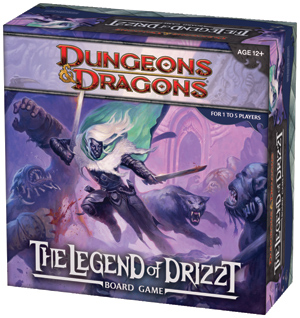 The third (and perhaps last) game in the series, The Legend of Drizzt, is the topic for Tabletop Co-Op today. First, let's cover the gameplay elements common to all D&D Adventure System Games. From 1 to 5 players can participate, each controlling a hero, represented by a detailed plastic minature. Heroes have the classic stats you'd expect, like armor class and hit points. Players choose from a set of power cards as the game begins. Some heroes' powers can be used repeatedly, while others only work once; be very careful about using the latter! The board is built as the game progresses, with a modular tile put into place anytime a hero explores an edge. In most cases, a new tile brings a new monster with it. Players draw a monster from the deck of monster cards, place the corresponding mini on the board, and resolve the actions on the monster card. Wise heroes will balance exploration with keeping the board clear of monsters. The endgame depends on the specific scenario the players picked during setup, which usually include scripted events tied to finding a specific tile or meeting some other condition. The whole system is very flexible, easily to modify, and provides lots of replay value due to different variables that change from game to game. 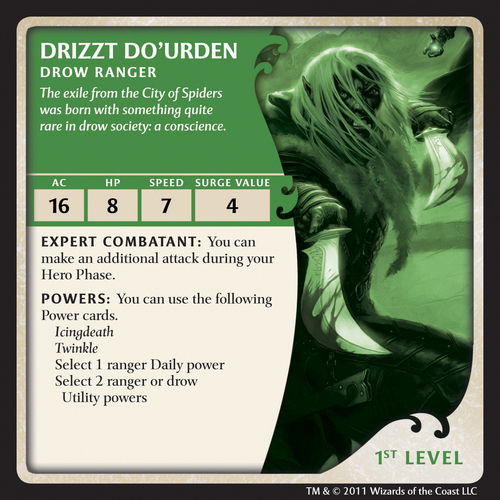 The Legend of Drizzt, as you no doubt would surmise from the title, is based on characters from the popular R.A. Salvatore books. All of the heroes and villains from the Dark Elf and Icewind Dale trilogies are included in the game, from noble drow Drizzt and barbarian Wulfgar to cunning assassin Artemis Entreri and the demon lord Errtu, who has an especially imposing miniature. For fans of the books, taking on the role of these characters adds greatly to the fun. Even for non-fans, these heroes have much more personality than the generic protagonists of Castle Ravenloft and Wrath of Ashardalon. Page created in 0.7126 seconds.